SpySats, WeatherSats, LandSats, RadarSats, and all sorts of other Sats are looking down on the earth to see what's happening there. The first earth observation satellites were the spy satellites used during the Cold War to find out what the other guys were doing. (See Spysats in the History section.) Weather satellites soon followed. With the end of the cold war, the use of high resolution imaging satellites for commercial purposes has become a new business. Several companies have, or soon will have, such satellites in orbit, and will sell the images for various remote sensing applications. Satellite remote sensing (RS) is, in fact, becoming the next big space money maker after telecommunications. There are a million and one benefits to remote sensing and everyone from archeologists to environmentalists to farmers to lawyers to municipal planners to oceanographers to zoologists to many others are using it. The RS data from space might simply be photos using visible light. Some spysats, for example, take photographs and return the film in canisters dropped out of orbit. However, the imagery can also be in the infrared. Or in many different colors, multi-spectral, or in many, many different colors, hyper-spectral. The swath, i.e. the width of the surface spanned by the image, also varies considerably. Some applications may need high resolution for small areas whereas other applications, such as resource management, prefers to see bigger areas at coarser resolutions. 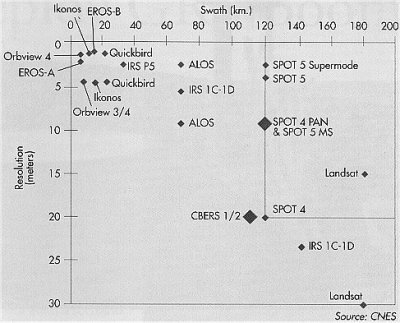 See the Resolution vs Swath graph for the various remote sensing satellites in operation. Radar imaging is another powerful RS technique where a satellite transmits radar pulses and then detects the reflections from the earth. Such radar can see through clouds and even into dry ground. Radar imaging has been used by archeologists, for example, to search for ancient cities and ruins. Each imaging approach provides a unique window on the earth. See the remote sensing introductory links for more information. ** Play the Where in the World? earth observation game at Bigelow Aerospace using images taken from their Genesis spacecraft. Check out also the Genesis I and Genesis II. LandsatLook Viewer - compare images of a given location as seen by Landsats over the decades. Earth Viewers - desktop screensavers - list of programs showing earth from space. Some include near real-time satellite imagery. Keyhole Community - forums dealing with Google Earth and other sat/aerial imaging. Images from weather satellites around the world are now available in near realtime on the web. Also, fascinating new types of atmospheric imagery are becoming available such as those of wind patterns. The hobbyist can assemble a receiving station to pickup the images directly from weather satellites with a satellite dish, and then display and manipulate the data on a personal computer. EDUSAT - "an educational websiteabout space imaging. SECRETS FOR SALE: How Commercial Satellite Imagery Will Change the World by Yahya A. Dehqanzada and Ann M. Florini - available in pdf format. NASA's Earth from Space is one of the most fun of the image databases. It is nicely organized into various earth features such as Cities Landscapes Storms&Weather. 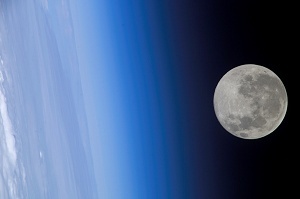 The Moon and Earth as seen by astronauts from the ISS. Select the satellite option and then enter an address of interest in the top box. The system uses satellte images from DigitalGlobe (see below). DigitalGlobe (formerly Earthwatch) will provide high-resolution, multi-band earth images from its Quickbird satellite that was launched in October 2001. The satellite will provide images of even higher resolution (~.6m) than theSpace Imaging's Ikonos satellite. In 2013, GeoEye, which had previously formed from Space Imaging (founded by Lockheed-Martin) and Orbimage (founded by Orbital Sciences), merged with DigitalGlobe. This company based in Raleigh, North Carolina offers satellite and aerial pictures of much of the earth. They work with a large number of imagery providers. Online search tool allows users to find images of sites around the world. Microsoft also offers its Windows Live Local, a map tool with satellite plus aerial imagery of the US. This company is "a global provider of high resolution image data, Geographic Information System (GIS) services, and mapping solutions. SIC accesses some of the world's most specialized remote sensors to procure satellite imagery and aerial photography for major industries. Sensors such as QuickBird, IKONOS and SPOT-5 produce high resolution satellite imagery as detailed as 0.6m from the QuickBird sensor." This site at Florida International University provides a "zoom in" service on a given location, via address entry, using satellite and aerial photography. A popup applet provides various options including a map overlay with labels on major highways and other landmarks. This site gives consumers free access to high-resolution aerial and satellite photos. One can enter a U.S. address of most metropolitan areas and then zoom in on neighborhoods. Maps pop-up to assist in navigation. The company will make money by selling higher-quality images on a subscription basis to other companies and web sites. The company claims to have the world's largest database - 12 terabytes - of aerial and satellite imagery. This Russian company now competes with Space Imaging in offering for sale 1 meter resolution images of just about any place on earth. Samples of the 1m imagery include sharp views of Los Angeles and New York City. Practice your imagery intelligence on these spy satellite photos collected by the Space Policy group at the FAS (Federation of American Scientists) IMINT Gallery. See Prime Pixel Picks of great spy sat shots. This collaboration of an Israeli company and others will market images from its constellation of imaging sats. The first satellite - Eros-A1 was successfully launched in Dec 2000. Gallery. Partners with Chinese based Twenty First Century Aerospace Technology Company Ltd to provide 1 meter resoluation imagery from the DMC3 / TripleSat constellation built by Surrey Satellite Technology Ltd.
Buy beautiful photos and posters of the earth at this NOAA store that draws upon huge database of remote sensing measurements over many years. Search by region, keyword. Many types of images available. This French company has led the way in the commercialization of remote sensing. It was the first private company to sell RS images on the open market. It's satellites were low resolution compared to spy sats, but they looked in spectral areas of particular interest to agricultural, mining, and other applications. AstroVision - will launch 5 GEO satellites to "...broadcast live, true color images of the planet 24 hours a day - providing businesses, educators, scientists and individuals, indeed, all the Earth’s inhabitants, with a unique window on spaceship Earth." First launch planned for 2001. Bigelow Aerospace - Where in the World? - an earth observation game at Bigelow Aerospace using images of the earth taken from their Genesis I spacecraft. Blue Marble 2000 - gorgeous image of earth created from a combination of RS images. EarthOnDrive - sells remote sensing data gathered from open government sources but bundled and organizated in a manner that is convenient for users. Global GeoScience - this company specializes in IKONOS imagery for remote sensing and GIS. The site offers some nice examples of using satellite images for such applications as municipal planning, transportation, environmental monitoring, and more. Planet Lab - constellation of smallsats in low earth orbit. terraXsite - combines remote sensing and demographic data. Aimed at commercial and government users. Skybox - Building an imaging satellite constellation. Bought in 2014 by Google for $500M. Urthecast - Uses both imaging satellites and cameras on the International Space Station exterior. Private citizens are using on line tools such as Google Maps and high resolution satellite photos to uncover secrets about North Korea. ESA - Kids - Earth - Explore planet Earth in near-real time! LandVoyage.com - This online site sells maps and photos based on satellite imagery, aerial photos, and USGS topographical maps. long exposures to obtain magnificently sharp images of the earth at night. One of the earliest suggestions for human tasks in space was to carry out earth observation for both military and civilian applications. The human eye provides tremendous discriminatory ability and can detect unusual features far more quickly than autonomous analysis systems. However, as manned flights remained infrequent and expensive, unmanned military spy sats and remote sensing sats came to dominate earth observation. Now, though, humans are making a comeback. With astronauts working for long periods on the ISS, which has an observation window with exceptionally clear glass, they are showing the power of human observation. Photos taken by the astronauts have reached resolutions of 6m, in the range of the best remote sensing satellites. Astronauts can also come upon for interesting ephemeral events that stand out but might have been missed by RS satellites. If allowed to develop, researchers on the ground could eventually interact in real time with the astronauts and give quick feedback on what they are doing. The researchers, for example, might see something interesting in a current image and then ask the astronauts to look for similar features at another spot on the earth. rove-to - 387,033 Shuttle images of Earth organized according to country. Oceanography from the Space Shuttle - This publication from 1989 is out of print. This pictorial survey of oceanic phenomenon visible to the naked eye from space is now only available on this web site. Thumbnails give previews of the many beautiful images. Twitpic.com/photos/Astro_Soichi - Japanese astronaut Soichi Noguchi who spent several months on the ISS in 2009-2010, took many marvelous pictures of the earth while on the ISS. He would notified the followers to his Twitter account whenever he posted a new image on his web gallery. The images of earth from space have long been noted for their mesmerizing beauty. NASA and the USGS recently posted a collection of some of the most stunning earth shots under the Earth as Art title. A" searchable directory of images, visualizations, and animations of the Earth." You can quickly find images of a particular type of landscape, e.g. deserts or rivers. If you hear about a hurricane, volcanoe, large area fires, or other large event, chances are that this site will offer some images of the event from space. This NASA database holds 250,000 images of earth. Photographic prints can be purchased for the images in the database. USGS - Maps, Imagery & Publications - See the images from the newest Landsat. This satellite is remaining in US Government hands so the image prices will be much lower than those from the earlier privatised satellites. LandsatLook Viewer - interactive tool allows you to compare images of a given location as seen by Landsats over the decades. NASA/ LandSat - Links to imagery databases for the Landsat series of remote sensing satellites. Includes the new Landsat 7. This satellite launched in May 2002 is dedicated to the study of the earth's "water cycle, including evaporation from the oceans, water vapor in the atmosphere, clouds, precipitation, soil moisture, sea ice, land ice, and snow cover on the land and ice." The U.S./ French satellite TOPEX/Poseidon measures global sea levels every 10 days, with unparalleled accuracy. Data including real-time imagery. This site presents images and data from NASA earth observation spacecraft including Landsat and Terra. Listing of all NASA remote sensing missions. Blue Marble Next Generation - Earth Observatory - Oct.2005 - high res images of the whole earth. "...allows any user to zoom from satellite altitude into any place on Earth, leveraging high resolution LandSat imagery and SRTM elevation data to experience Earth in visually rich 3D, just as if they were really there. Particular focus was put into the ease of usability so people of all ages can enjoy World Wind. All one needs to control World Wind is a two button mouse. Additional guides and features can be accessed though a simplified menu. Navigation is automated with single clicks of a mouse as well as the ability to type in any location and automatically zoom into it. World Wind was designed to run on recent PC hardware with 3D acceleration." It runs on a PC and "requires DirectX 9b and the .NET Runtime environment to be installed. These have been included in the World Wind installer." World Wind Wiki - open source development of the program. TERRA is the first of a new generation of NASA Earth Observation spacecraft that bring powerfull new imaging systems to examine the earth. Now declared Open for business, the craft is already producing spectacular images. See the Images and Data section for examples. Check the levels of ozone over the earth with images from the series of small NASA satellites especially designed and orbited to measure atmospheric ozone. The U.S. Geologic Survey's Earth Resources Observation Systems (EROS)Data Center in Sioux Falls, South Dakota holds the world's largest database of earth science information. See the Cororna satellite imagery description for details of the images. Obtain various earth resource observation images and data obtained as part of NASA's EOS program. You can run the program in your web browser by going to ISS Now. More info at Windows on Earth - Wikipedia. Listing of all NASA remote sensing missions at the Earth Observatory. Global Climate Change: NASA's Eyes on the Earth - several interactive earth maps involving data related to climate. Climate Essentials - contains galleries of imagery and data graphics for ten different climate related areas. NASA's Suomi NPP earth observation satellite. True Marble Imagery - UnearthedOutdoors.net - super high resolution satellite view of the earth available in 32 tiles, each 21k x 21k pixels for free download.